Be more, do more, live more. Have less. What Makes Life Simply Richer For You? The Astor Orphan is a memoir written in the same genre as The Glass Castle and Welfare Brat, both of which were considerably better than this one. Alexandra Aldrich is sympathetic, and although we are roughly the same age, I often found myself wanting to adopt her and give her the sort of nurturing that all children deserve. But as a memoir, The Astor Orphan is too thin for the breadth that she's attempting. The story connects Aldrich's 1980's childhood with her forebears, but few of the characters are fleshed out. Her mother is cold, "icy" as the jacket text describes her, but there must be more to her, since Aldrich claims to want to rescue her from the father that she (Alexandra) seems to mostly adore. The relationship with her grandmother is complex. Although she's at pains to show Grandma Claire as a resource and a figure of relative security in hr life, many of the incidents described that involve Grandma Claire are brutal. With every vignette I wanted to know more about the situation, to get the details of how it worked out, to understand the players more fully, and with every vignette, I was left hanging. While these stories may have been complete in the author's mind, I felt like she didn't communicate that completeness in the story. This incompleteness totally culminated in Alexandra Aldrich's "escape" to boarding school. How good an escape was it? What did she do with her new liberty? Did she go home for Thanksgiving? What did she discover about herself, or come to understand about her father, by attending his alma mater? How many of the dire stories that he told her about his time there did she experience for herself? Did she ultimately "rescue" her mother and attain the sort of orderly life she had been craving? The reader never finds out, because the story closes abruptly, when she is deposited at the Brooks School for the first time. Finally, the prose itself: spare; simple sentences; a little repetitious. I liked it in a way, since the spareness of it felt straightforward and refreshing, but it also felt like a mask. I appreciate that the subject was difficult for Aldrich, that perhaps in some ways she is still too close to the material to write it as openly as she may have intended. But if she was ready to write about her unconventional childhood, then I wish she could have written more fully and openly. It's unfortunate, perhaps, that The Glass Castle was so extraordinarily good and written in a generous and evaluative spirit, because every other "deprived childhood" memoir that comes after it almost necessarily suffers by comparison. 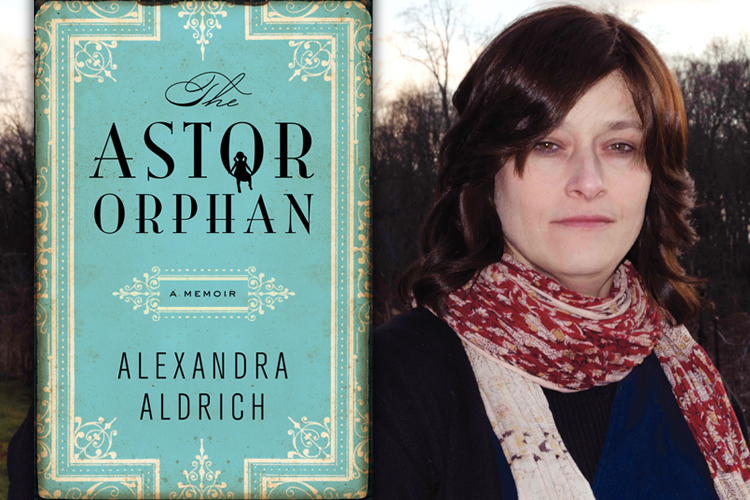 If Alexandra Aldrich writes a follow-on to The Astor Orphan, I'll read it, because I sincerely want to know how one hangs on to the precious parts of a heritage and discards the corrosive elements of it to emerge as a whole person. But perhaps she isn't ready to write that story. Part of our daily school commute, I'm so lucky! In spite of the fact that I still can't find my John Lennon calendar, this move has been perhaps the smoothest that a cross-country move mid-school-year with three school-aged children could be. Our new community has been incredibly welcoming and the town itself is the best-kept secret in the country. Although we froze our tuckuses (my 5-year-old's favorite new word) off in February and March the spring has been absolutely beautiful. Our walks to school take us through the city's largest park and along a pond and creek full of ducks and geese. The creek is crossed by a series of architecturally interesting and diverse bridges, some of them quite elaborate and all of them well-maintained. Many of the houses are historic -- dating back to the 1850's and earlier -- and the entire area is set off by mature trees, daffodils, and tulips. The down side is particularly sad given the loving care that has been tended to the appearance of the houses, park, and historic downtown where we spend most of our time. The park is PACKED every weekend, and for a large part of each day; runners, walkers, toddlers and their caregivers. But the sides of the stream are littered with plastic bags, drink bottles, and random trash. There's even a discarded Big Wheels tricycle tangled in one of the trees at the water's edge. Cigarette butts litter the gutters along the road where smokers toss them out their windows as they drive. One of my to-do list items is to buy each of the children gardening gloves so they can help take on yard-cleaning duty from all the trash that blows into our bushes from the street. I feel like I'm living in one of those great fraternity row houses in Athens, Georgia that look beautiful, and ought to be beautiful, but have been abused by residents who don't know how to care for such a treasure. The sight of all this trash, of the thousands of plastic bags leaving the grocery and hardware stores each day, of the styrofoam take-out containers we're handed at restaurants, has made me disheartened. Now that we're away from Marin County and I am seeing more clearly what consumption looks like in our country, and I have to admit, it has brought me down. The effort to do better is going to be a lot harder than I was accustomed to when I was part of the Marin County Kumbaya Patrol. I'm not myself lately... A key element of my home office has not been found since the move. My John Lennon calendar is missing. Friends, I will try to return to my regular postings as soon as I'm able, but first I must find John. Until then, I can be found frantically tearing through the remaining boxes in my office. Please keep John and me in your thoughts. In an effort to improve my fiction writing, I'm working on more short stories. 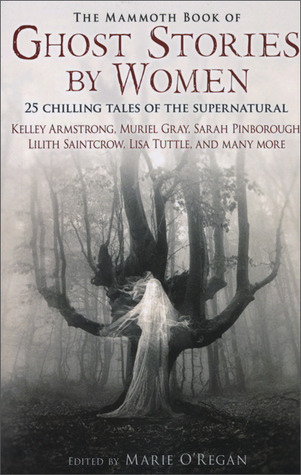 And in an effort to improve my short stories, I picked up The Mammoth Book of Ghost Stories by Women. I learned a lot, not least of which it takes a lot of skill and attention to craft a short story that is vivid and meaningful at the same time. There are some gems in here, though I gave the collection overall only three stars out of five. At 400 pages, the editor could have chosen only the best ones and still had a substantial collection. NOTE: A few spoilers follow. I've camouflaged them, so if you don't mind reading them, simply use your mouse to select the gap portions and it will be readable. Overall, the collection was uneven. Generally it was arranged from the weakest stories to the strongest. The first few stories were so weak that I wondered if this was all that was expected of women in this genre, which was depressing. "Field of the Dead" started strong and the action was gripping and fun. The punchline, however, was disappointing at best, and, frankly, a plot hole to my mind. How would the village audience have seen Thom the child mummer given what we discover of him at the end? But I could almost forgive it since the world Kim Lakin-Smith had created was so vivid and the action so urgent. "Collect Call" was so trite it barely merited inclusion, and does not merit comment by me. "Dead Flowers by a Roadside" again was trite, more touching but ultimately didn't take the reader anywhere interesting. "The Shadow in the Corner," written by Mary Elizabeth Braddon (1835-1915) was interesting because it was very vividly a product of the period when the author lived, and the characters were clear and intriguing, but this one also didn't really go anywhere, and especially not with Daniel and Mrs. Skegg, whose reactions to the events of the story would have brought meaning to the tale. "The Madam of the Narrow Houses" was an interesting premise, which contrasted what we think we understand of people with what they actually are. I would have liked to have seen a little more consequence to the story. "The Lost Ghost" was touching, an American story written in roughly the same period as the Braddon tale, a meditation on compassion that endures beyond ordinary bounds. "The Ninth Witch" is a spare tale that lasts over a long lifetime. The premise was interesting: the foundation of a myth set in some post-apocalyptic time that the main character doesn't fully understand. This one too has a plot consequence that negates a claim made at the beginning of the story and isn't dealt with. By this time though I was getting a little fatigued by pointlessness of some of these stories so I may not be giving it the credit it deserves. "Sister, Shhh..." was depressing and sad, seemed to have been more toying with the idea of LDS fundamentalism than the characters themselves. And didn't go anywhere I wanted to be taken. "The Fifth Bedroom" was a proper ghost story, with an innocent but embittered young woman, a very bitter and not at all innocent ghost, and a swindle. Maybe not the deepest read in the volume, but a proper ghost story, with atmosphere, beautiful pacing, and a heartbreaking ending that was worth the read. "Scairt" was a parent's worst nightmare with a miraculous ending. "Seeing Nancy" was in the same vein as "Scairt," in some ways; but the protagonist is taken in and the terror of the tale is in many ways set to occur after the story closes. "The Third Person" was a cautionary tale about a woman who loans her flat to an unfaithful wife. It was tremendously vivid with an absolutely terrifying ending. From here the stories started getting a bit stronger, more pointed, with characters who changed and sometimes even grew. If the first half of the volume was a bit of a slog, from here the stories were more interesting, more thought provoking, and harder to put down. "Freeze Out" was a family tale in which all was not as it seemed. "Return" was the tale of a highly dysfunctional family forced to confront their dysfunction in an unconventional way. "Let Loose" by Mary Cholmondeley (1859-1925) was another proper ghost story in which the arrogance of a young architect sets an evil loose on the world. This one was reminiscent of the atmosphere in Bram Stoker's Dracula. "Another One in From the Cold" revisits the bloodbath of the First World War and the ways in which contemporary people romanticize real sacrifice when they fail to understand how real history was to the people who lived it. The situation in which the protagonist is set to bring closure to a lost soldier is perhaps not totally unique, but is told in a way that makes the soldier's situation important, urgent, even; when the story comes to conclusion it is clear that the protagonist is set on a path she wouldn't have chosen on her own, but to which she is committed. This was perhaps one of my three favorite stories in the volume. "My Moira" was a fun read, a contemporary story set up in a time and place that will feel familiar to many readers, but with just enough twist to make it fantastic. Another of my favorites from this volume. "Forget Us Not" was one of my least favorite; in the vein of "Dead Flowers by a Roadside," the protagonist is unable to move forward from a devastating loss until she gets a ghostly visitation. Though both were competently written, the premise just felt stale. "Front Row Rider" had a twist that gave me that little ah moment that George Saunders is necessary to a successful short story, but it did not make my top three; it was competently thought through and executed, it just kind of lacked bite. "God Grant That She Lye Still," by Cynthia Asquith, (1887-1960) covered that charming 1920's or so period that was lacking in the book up to this point, and was very nicely paced. For theme it echoed "The Fifth Bedroom," though the protagonists in these two stories, as in "Forget Us Not" and "Dead Flowers by a Roadside," had different fates. "The Phantom Coach" by Amelia Edwards, 1831-1892, was fun to read but not terribly cohesive. It had a big "so what" in the middle that spoiled the story for me, although the main character's dawning terror and attempt to save himself were nicely drawn. "The Old Nurse's Story" by Elizabeth Gaskell (1810-1865) has everything in it that makes me enjoy Gaskell's novels. She is homely, she values family, she values respectability and moral uprightness. She is plain spoken and her heroines strive to do right in spite of all the many obstacles she throws in their paths. If all of literature were like a Gaskell novel then literature would not be nearly so fun, but to sprinkle a little in here and there, like including one of her stories in this volume, is a refreshing breeze that reminds you that not all the world is full of lonely, bitter, cynical people. One of my favorite parts of the story was when the Old Nurse told the children she was speaking to (the offspring of the little girl in the story) that though they were cute, none of them was even remotely as precious as their mother had been as a child. It made me smile, and also it laid the foundation for how devoted the nurse was during the events of the story. The final three stories were all absolutely good, and the two contemporary authors represented here, Gail Z. Martin and Gaie Sebold, created such vivid and intriguing worlds that I'm putting their novels on my to-read list. "Among the Shoals Forever" followed a pirate with magical abilities who is part of a secret organization to protect the world from dark magic objects. In the story he is hunting a powerful necromancer with the assistance of a ghost, a vampire and a voodoo high priestess. The story is set in Charleston (colonial Charleston? Certainly pre-Civil War) and beautifully contrasted the young man's character with the urgency of his mission. I'm hoping that some of Gail Z. Martin's novels follow Dante, Coltt, Evann, and Sorren. "Afterward," by Edith Wharton, was a very fun read. Ned and Mary Boyle buy their dream home in rural England with money from a fortuitous business endeavor, the Blue Star Mine. One of their requirements for the house was that it be haunted, which the friend who helps them find the property promises it is -- "Oh, there is one of course, but you'll never know it." When Ned disappears mysteriously mid-way through the story, Mary searches frantically, until she realizes that he is the victim of the haunting they had mocked. Lovely point in the story is when Mary realizes that she had been enjoying the fruits of her husband's work without ever having a clear idea of the means by which he had attained their good fortune. This, to me, was the meat of the story and gave it its power. "A Silver Music" by Gaie Sebold promises a much richer world than just a short story can properly contain, so I hope to find more of it in her novels. A cynical detective investigating a murder finds that what he had thought were two mutually exclusive worlds had come together in a gifted young man who sparked love in a most unexpected corner. While it might have been a conventional detective story in any other setting, Sebold gave this one a richness and poignancy that really elevated it. So there you have it... Three stars altogether, to balance the ones that weren't worth the time against the ones that are sending me deeper into their authors' canons. It should be noted that there is a whole series of Mammoth Book of... volumes with various themes. Happy reading! I was all about congratulating myself on the great job I'd done purging. We came in almost 5,000 pounds below the moving estimation of 20,000 pounds. The estimate was almost 3,000 pounds below our shipping weight when we moved from Georgia to Virginia -- twelve years ago. Pre-kids, too. I practically dislocated my shoulder patting myself on the back when our packers announced we had only 120 boxes. We moved to California with over 400 boxes. Not quite six years ago. With two kids rather than three. After I purged about three rooms worth of belongings in preparation for that move. Well, folks, I'm unpacking now. Including the boxes from the storage unit, which of course the packers didn't count, I think we still came in under 200 boxes. But I'm sitting in my office looking at THIRTEEN BOXES OF BOOKS (not to mention the ones in other parts of the house) and I'm thinking maybe I could have done a little better. It will be interesting to see how much I unbox that I could have left behind. Now that the kitchen is in functioning order I will start trying to take pictures, and once we find my husband's camera I'll even try to make them good pictures. In the meantime, look around the space you're in and find fifteen things you can part with. Imagine yourself unboxing them after a move (preferably when you're looking for something vital, like the bath towels), and think what you'd feel like if you opened a box and found that item looking at you. I'm unpacking more than just boxes. I'm unpacking the life we intend to build here, from the practical to the playful. When I'm knee-deep in packing paper, with many more boxes before I sleep, it helps to remember that bigger picture. One afternoon I found myself with an hour to spare in a part of town that made it inconvenient to go home before I had to pick up a kid. There happened to be a bookstore right there. And so I found myself, for one glorious hour, browsing a brick-and-mortar bookstore for no other reason than that I could. One whole hour spent just wandering shelves, looking at titles, flipping through cookbooks and pondering new releases. 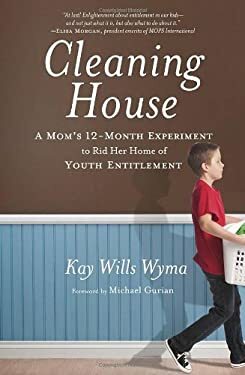 We're preparing for a cross-country move with three kids, and I thought Kay Wills Wyma's Cleaning House: A Mom's 12-Month Experiment to Rid Her Home of Youth Entitlement would be a great resource for how to motivate the kids to give me the help I need to make this process go smoothly. Wyma claims her Experiment was prompted by her 14-year-old son's off-hand request for a Porsche for his 16th birthday. She came up with a twelve-step program to teach the children the hows and whys of self-sufficiency. Each month was assigned a step (see below for a list). Each month she announced, via a pseudo-democratic family meeting, what the project of the month was. She heard the groans, the protests, and the eyerolls, and she persevered. She gave each child his or her own container, put a dollar for each day of the month in it, and then set them to work. If they failed to do the required job they lost a dollar for that day. At the end of the month they kept whatever remained. As the year progressed, the chores that had been practiced the month before were retained, so that in the first month they were earning a dollar a day just for keeping their rooms neat, and by the end of the year they were keeping their rooms neat, doing their own laundry, helping to plan, prepare, and clean up after meals, and more, all for that same dollar. Halfway through she also instituted a jobs board that enabled kids to earn extra on additional projects. It was generous of Wyma to give readers insight into her family. I always appreciate hearing how normal my kids are -- other people's kids give more or less the same kind of trouble in more or less the same proportions as mine. It also was reassuring; my kids have been helping set the table, clear dishes, make beds, dust, sweep, empty the dishwasher, sort dirty laundry, fold and put away clean laundry, and help out with the grocery shopping since they were very small. Wyma's kids didn't know what produce was. So at least I knew I hadn't been slacking as much as I feared in the personal responsibility aspect of child-rearing. But as interesting as I found Wyma's insights, the book was lacking as a parenting guide. It really is just an account of how things went for one family. Her kids never failed; the dollar and her word seemed to be sufficient motivation for them. If I promised my kids a dollar a day to clean their rooms and make their beds, I'm pretty sure they'd earn only maybe half the money (at best), because they are so unaccustomed to having a regular income. Not getting a dollar they wouldn't have gotten anyway makes little impact on them. Nobody in her family ever seemed to balk at whatever she was asking of them, or if they did she didn't talk at all about how she coped with the resistance. They complained and maybe rolled their eyes, and then they did it. They also never seemed to fail even when they made the attempt. Failure happens, even when the kids are moved by a generous spirit, as when my six-year-old broke a glass while emptying the dishwasher. He was so excited to help and show how capable he was that he was moving fast. The look on his face when he dropped it was heartbreaking. Of course he was barefoot, so my reaction was "DON'T MOVE!" because I was afraid he would step on the glass and cut his feet. But he heard yelling and thought he was in trouble. When we got everything cleaned up he said "I guess I should just go back to putting away the silverware." Of course I reassured him and he got over it; the point is that her kids rarely failed at what they attempted, except from resistance or laziness (as when they were cleaning the bathroom), nor does she address how to draw the line between a job done poorly but with good intentions and a job just flat out done poorly. Another difficulty I had with this book is that her conservative political bent sometimes manifests as though her kids are liberals (she actually uses the word "socialists") who expect handouts, while she, the responsible conservative, wants them to be responsible for themselves. As a liberal, I really object to her position, but since it doesn't cover the majority of her book, just kind of flavors it, it is not a reason to avoid it altogether. I do want to point out, however, that liberals want their children to be as empowered and capable as conservatives do, and that if she does continue writing like this that I would find her work more compelling if she left the liberal-conservative thing out of it. And also, used the word "socialists" correctly. I'm not sure if Wyma meant Cleaning House to be a parenting book or a memoir; she did almost no research to support her assertions. She mentioned Michael Gurian's Wonder of Boys a few times, but it sounded like she had heard it recounted to her, rather than read it herself. There were a few other snippets of professional advice scattered throughout, but mostly it was the anecdotal sort from other families, so helpful, but not necessarily authoritative. Surely over the course of a year she could have read his book herself (especially since he blurbed hers for her)? And perhaps one or two others on similar topics? Overall, I'd give Cleaning House 3 1/2 stars out of 5. I take a full star off for not being specific enough about resistance and failure, and half a star for putting a conservative slant on a topic that does not need to be politicized. If you'd like a jumping off place for helping teach your children to be useful, confident adults, you could do worse than this book. I just wish that Wyma had done rather better. I started Day 7 of my Advent Gratitude intending to write about how grateful I am not to be a minimalist. Because I am blessed with an abundance of office and craft supplies, I could contribute to our school book fair's organization and marketing without having to sap the money we raised for the library. I had a fantastic time working at the book fair, was inspired to read lots more books, and felt really confident in making recommendations to our customers. In the middle of all those warm feelings, we learned that the job my husband had been pursuing was actually offered to him. We're moving to Maryland! I'm excited for this new transition. We'll be driving distance to family again, so no more relying on airlines and all their restrictions to maintain our most important relationships (and foster our kids' sense of family). We have friends a short distance away that I'm looking forward to reconnecting with, and the town we're moving to is diverse, but with a long history, has amazing restaurants and tons of character, and should be really fun to get to know. We made a quick trip east to find a house. We are buying again, although we'd left that decision till we saw what was available. The new house fits the lifestyle we've been trying to build here for the last few years beautifully. It's older, and needs my loving care (unlike the Big House or the rental). It has a giant yard, with plenty of space for the kids to play like crazy and for me to start another kitchen garden (or, down the road, maybe even chickens!). It is bigger than the rental, nearly as big as the Big House, but we didn't choose it for sheer size. The layout of the rooms is more in line with our needs. There is space for my husband and I each to have our own offices again. This was of very great concern to us as we searched for a new home; we have such different styles in how we use our workspaces that it's not comfortable to either of us to be together. Rather than having three living rooms, as we had in the Big House, we have one living room, one dining room, and a kitchen with enough room for the kids to have breakfast while I make lunches, but not so much space that we need two complete dining sets. Crucially, the house has a basement. This is not the sort of amazing man-cave basement with the wet bar and the giant movie projector, but a simple, large, dry space with walk-in storage for Christmas supplies, etc., and open space for the kids to play. Best of all, the house is in town, walking distance to a huge selection of local shops and restaurants, as well as the kids' schools and my husband's new office. We won't have to be car-dependent (as much, at least, as we have been). The kids will be able to hang out with their friends without tons of scheduled playdates, and I'm looking forward to their developing the independence, confidence, and spontaneity that comes with personal mobility. I am not a minimalist. I don't want to be a minimalist. I am grateful to have had the experience of our little rental house to help me be able to shape our priorities, and I am grateful for the liberty that this upcoming transition will bring me. As I navigate this transition I hope to continue to share the lessons I've learned here with all of you. And I hope you'll follow me to Maryland as I continue to learn to make our life the richest, fullest, kindest life we can lead.